The consistency and commitment by organizers in staging Standard Chartered Nairobi Marathon has contributed in unearthing new road race talent every year. Sports Minister Dr. Paul Otuma lauded the important role that the Bank has played by merging sports and charity, through the marathon’s Seeing is Believing Initiative. 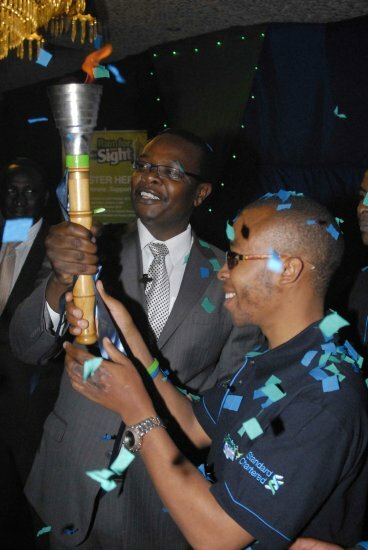 “The Stanchart Nairobi Marathon has grown in stature, not only as an international race but a worthy course for the restoration of eyesight,” said Otuoma in Nairobi during the launch of the eighth edition of the annual event on Wednesday at a ceremony filled with pomp and fanfare. The marathon launched in 2003 by the Standard Chartered Bank with a target of restoring the eyesight of 28,000 people, has so far restored the sight of 3,000 children in Kenya. During the ceremony, the Minister received and handed over the marathon torch to the event's Goodwill Ambassador renowned Paralympian, Henry Wanyoike. Otuoma together with his Assistant Kabando wa Kabando and Permanent Secretary James Waweru were among the first runners to register for the marathon that will be held on October 31. The race director, who is also the IAAF regional Technical Director John Velzian, revealed that this years runners would run on separate dedicated lanes to prevent mix-up. Runners will be registered under full marathon (42km), half marathon (21km), wheelchair race (42km), family fun race (10km) and the corporate challenge. Standard Chartered hopes to top the 13,000 entrants drawn from 38 different countries who competed last year.